My mother told me never to call someone a liar. In our otherwise energetically verbal family, calling someone a liar was crossing a bright line. “Don’t go there, ever,” my mother would say. To call someone a liar was to make a statement about person, about character, about motives, and not about content. The person-part mattered in my family. That did not mean that everyone’s opinion was accurate or true. My mother was definitely not into our current notions that respect makes everyone’s opinion okay. No, some things were true and some things were not. We were told always to speak what we believed to be true, no matter the implications to ourselves or others, but if you disagree, as you inevitably will, treat the other person with some measure of respect. Listen before you argue, even as you go on to make your own case, with great vigor if need be. My mom certainly didn’t use all of these words, but we got her message clearly. Maureen Dowd thought the vice presidential debates last Thursday night were the way Irish Catholic families, like hers and Joe Biden’s I take it, have discussions around the family dinner table. No big deal. This is just the way people talk together. This is the way to treat each other while having a discussion. My mother would have been very uncomfortable at Dowd’s or Biden’s dinner table. Thank God our American political culture adopted, for most of our history, another way of disagreeing, something closer to my mother’s way. On Thursday night, Vice President Joe Biden crossed the bright lines of my family upbringing. He took us into some ugly new territory of political discourse. Some commentators thought he scored substantive points. I had a hard time hearing anything he said because of the snarky smirking routine. His derisive laughter showed utter contempt for his opponent. It showed disrespect, attempted dismissal, an effort to diminish. 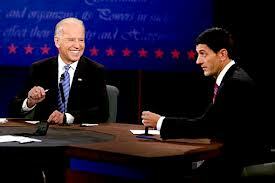 Joe Biden took American political discourse to the lowest level I have witnessed in my lifetime. If we have any chance of solving the amazing cultural, social, economic problems we face, we must bring all the best minds we’ve got to the table. In my opinion there is a public yearning for our leaders to work together to reach solutions. Yes, indeed, we are divided as a nation on how to address those problems, and we need bracing discussion and debate. But when we look at our looming deficits, our staggering national debt, our broken schools, dangerous violence in the world, the disparities between the rich and the poor, loss of opportunity for far too many, rampant violation of the sanctity of human life—don’t we need all the best thinking we can get? We need new ideas and new thinking. We need to offer a chair at the table to the younger generation. Lord knows we need to work together! Disdain, ridicule, dismissal, and diminishment for those with whom we disagree will not cut it anymore. The grand smirk cannot be the ultimate gesture of our troubled day. Can’t go there, my mother would warn. Disdain and dismissal will only limit our options. Disagree? To be sure. Vigorously? By all means. But do so with respect and gratitude for what others bring to the table.